The goal of the Student Spaceflight Experiments Program (SSEP) is to inspire America’s next generation of scientists and engineers, and engage entire communities in the process. In this vein, we believe that it is vitally important that participating students have a lasting recognition of their involvement in America’s Space Program, and their role as researchers in real microgravity experiment design, or in public communication through mission patch design. We want them to remember always their part in this program. Rabbi Ari Ginian is the SSEP Community Program Director for Inwood New York, for SSEP on the final flight of Space Shuttle Atlantis (STS-135). He suggested in 2011 that the National Center for Earth and Space Science Education make available a Student Certificate template to SSEP communities in recognition of student achievement. He also asked if the NASA logo could be included, even though SSEP was a commercial space venture. It was a wonderful idea. We asked NASA Headquarters if that would be possible and they graciously granted the needed permission. We are grateful to NASA for its stunning support of this program since it began in June 2010. 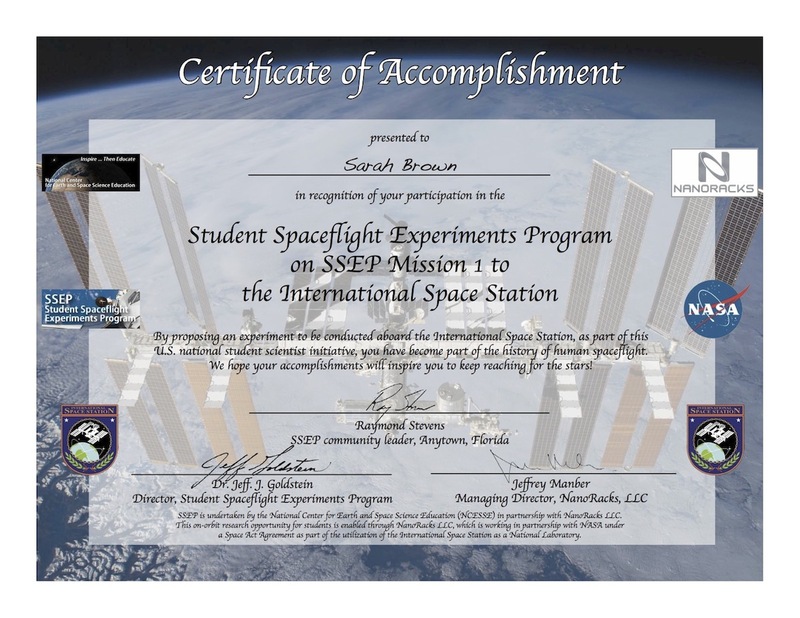 The Center is therefore proud to make SSEP Student Certificates of Accomplishment available to all communities that have participated in the SSEP flight opportunities to date. We understand that this likely comes too late for the Shuttle flight opportunities, but wanted to still make them available. The certificates are ready to be printed, signed by a community leader, and given to the students that have participated in the program. The certificates include imagery, logos, and emblems related to the flight opportunity, as well as electronic signatures by Dr. Jeff Goldstein, SSEP Director, and Jeffrey Manber, Managing Director of NanoRacks, LLC. The certificates are designed so that they can be customized to each community by including the name of the community, the name of the community leader who will sign the certificates, and the mission patch that was selected for flight from the community. The community leader may also provide an electronic signature to be incorporated in the certificate. An Important Note: NCESSE can only make certificate masters available to the SSEP Community Directors and Co-Directors in a community, or to some other designated community leader. We have already sent word out to the Directors and Co-Directors for all four flight opportunities to date on how they can obtain certificate masters for their community. SSEP is undertaken by the National Center for Earth and Space Science Education (NCESSE) in partnership with NanoRacks LLC. 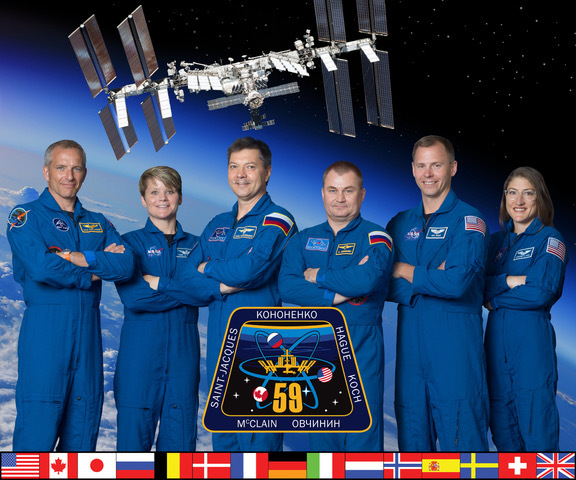 This on-orbit, real research opportunity for students is enabled throughNanoRacks LLC, which is working in partnership with NASA under a Space Act Agreement as part of the utilization of the International Space Station as a National Laboratory.